And just like that, I found ‘my’ Julian. 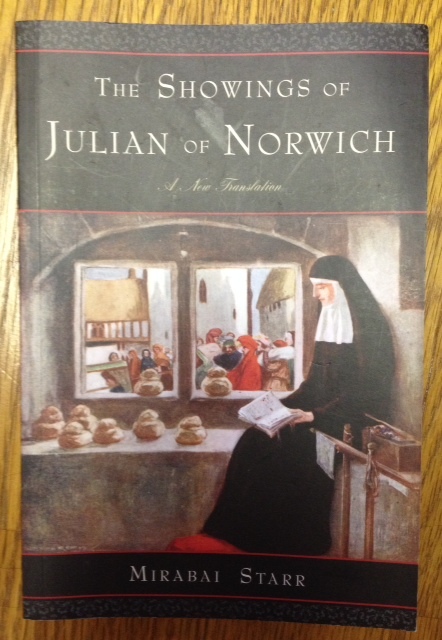 The translation which sounds to me like Julian’s authentic voice, the one that feels like home, the one that touches my heart: The Showings Of Julian Of Norwich, A New Translation by Mirabai Starr, published by Hampton Roads. When I first started reading different editions aloud of Julian as part of my daily devotion I had 2 aims. One was to find the edition I could take to read from every day, and the other was to be able to give or recommend a full text to anyone who was looking for one. So this is my eighth Julian, but only the sixth complete text. The first was the pocket-sized Enfolded In Love book, and I keep a stack of them at home to give as a taster of Julian’s writing. I have given the current Penguin Classic (Elizabeth Spearing translation) a couple of times, and the John Skinner translation, but while I really liked them I didn’t feel I had found a translation to live with. There have been translations I had expected to love which have left me cold, and so I came to this one without many expectations. The biography of the translator at the back of the book describes her as being ‘at the vanguard of the emerging Interspiritual movement’ and I read it with a sinking feeling, anticipating some kind of New Age woolly version of Julian. How wrong I was. One of the quotes on the back of the book describes it as a ‘faithful but freeing’ translation, and while I haven’t read Julian’s original version I agree that this version is wonderful. It flows, it is poetic, it is easy to read and read aloud has the easy, musical cadences of a woman speaking of things she has meditated upon and knows well, of things she loves deeply and wants to share. This, to me, is Julian’s voice. I still have a number of translations to read, but I have found a translation to live with, to return to again and again. A translation as good as this is a wonderful gift to the world; to achieve it required a sensitivity to the material, but also a humility, a willingness to step back, to remove the self from the equation and facilitate another’s communication. This is Julian’s voice, and only Julian’s voice, and this is what makes this book stand apart from all the others I have read. All the others, to some degree, for me had a feeling of control, of another voice or mind beside Julian’s. Mirabai Starr has crafted a wonderful translation, she has given Julian her voice. This entry was posted in Editions of Julian's writing and tagged Elizabeth Spearing, Enfolded In Love, Hampton Roads, John Skinner, Julian of Norwich, Mirabai Starr, Penguin Classic, The showings of Julian of Norwich by tokyopurplegirl. Bookmark the permalink.